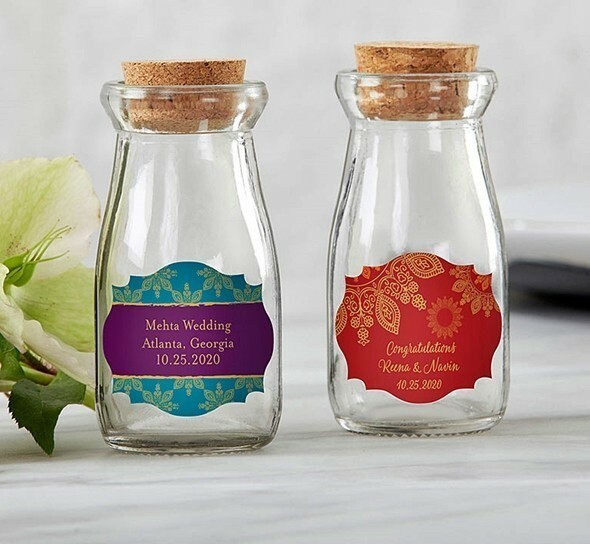 Offer something truly unique to your Indian Jewel-themed bridal shower or wedding reception with these personalized milk bottle jars customized with your choice of two quattrefoil sticker colors with two lines of custom text (in the pictured fonts only). Each nostalgic miniature milk bottle jar features a real cork top and large, easy-access opening. PLEASE NOTE: Personalized labels arrive unattached from the jars, so some assembly is required. Sold as a set of 12 and prices quoted below are per set. Due to personalization, the minimum order quantity is two (2) sets of 12.